One by one, students from Centennial High School in Columbus, Ohio, stepped up to a mic Tuesday to share their personal messages about gender stereotypes. They performed powerful poems and songs for a senior orientation program at the school. Every piece of work centered around one theme: masculinity. "If you remember nothing else, remember this — you don't have to be hyper masculine to fit in," Aria Brent told classmates in a packed auditorium. 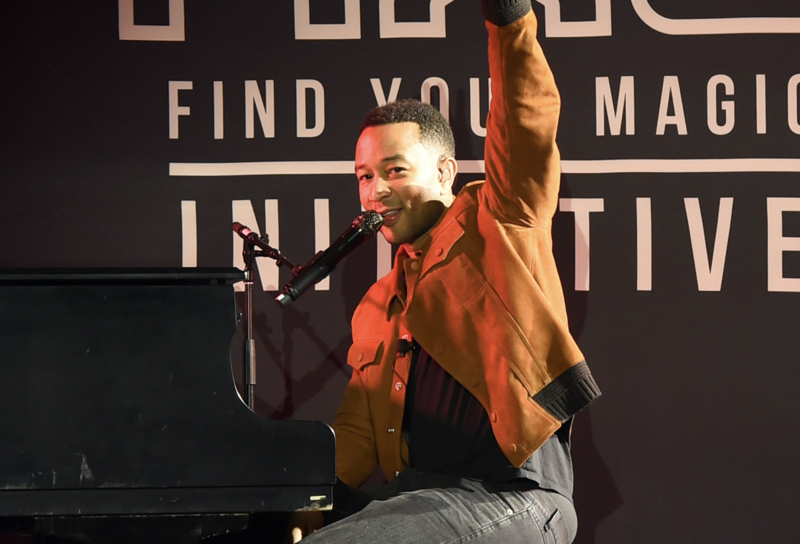 It was advice the high school senior learned during her weeks-long mentorship with ten-time Grammy Award winner John Legend. This year, Legend has been guiding students as part of AXE's Find Your Magic Initiative, a new program dedicated to bringing a message of self-expression and inclusivity to teenagers. This year, the 38-year-old artist partnered with author Carlos Andrés Gómez to mentor high school seniors Aria Brent, Kitano Watkins and Deiontay Bowie. "The whole idea was to encourage individuality and creativity," Legend told CBS News over the phone. "Particularly focusing on the idea that there's no one way to be a man — no one way to be masculine. Young men need to get beyond that fear of being different and embracing that individuality." Legend, who grew up in nearby Springfield, Ohio, said he understands the hardships teens face on a daily basis. He had his own struggles growing up. At the age of 11, Legend's parents went through a divorce. He and his two brothers and sister were raised by his father, Ronald Stephens. "That was a challenge," Legend said. "We had to take a lot of responsibility for ourselves, because we had a single parent." Another challenge, Legend said, is learning how to "thrive and survive" in school. "Part of it's the social aspect of how you want to fit in, making friends, dating and all these other things," Legend said. "When you're a kid, as much as you want to feel confident about that, all of us feel pretty insecure about all of those things." This event that you took part in is close to your hometown. What was it like being back? I love it. I feel very connected to the young people here. I know what they're going through now 'cause I was going through it as a kid and I did it in a similar town and area and part of the country. So I feel like I have a lot in common with these kids. It's fun for me to talk to them because I know they have a lot of potential and it inspires me to connect with them and do what I can to help them. You mentored three students this year. What kind of activities did you do with them? We Skyped and we talked about all kinds of things — what they were thinking about their careers and what they want to do in life. We talked about their performances they were going to do. One was a rapper, one wrote a poem and one was a musical performer. All of them did a great job expressing themselves. What was it like seeing them finally perform and break out of their shell after you'd been working with them for weeks? I don't think I made them break out of their shell. They were really passionate and they were the kind of kids that no matter what kind of advice I give them I think they're going to to OK. But I hope we nudged them in the right direction. You were obviously very into music at an early age; would you recommend kids getting involved in the arts, like you did? Yes, absolutely. It helps you discover who you are — discover your voice. Even if you don't end up doing it for a living it teaches you skills like how to work with other people, how to listen, how to collaborate on projects. And that's why I'm such a big proponent of keeping the arts in our schools and funding the arts in our schools, because we fund sports we fund all these other activities — we need to make sure we fund people's creativity and the discovery of their voice. Your music is very emotional. How did you find your voice? Part of finding your voice is listening to others. You have to look inside and say, "Well, what is my story? What am I going to contribute? What can I say that's true and authentic and honest that will resonate with other people?" And so, finding that voice is what will distinguish you as an artist. What is it like being a role model to young people and knowing their attention is constantly focused on you and your work? I don't think about it too much. I think more about the opportunity that I have to influence people, influence the culture, influence politics and influence the way we all live together. I know there are plenty other artists and individuals that have that kind of power, so I'm just one of many, but I try to use my voice and my power for good, and try to make the world better in whatever small ways that I can do it. You've been on tour to support your latest album "Darkness and Light." What else is coming up that you'd like your fans to be aware of? The next part of the tour is in South Africa, but all over the world, we just released a new video called "Penthouse Floor," featuring Chance the Rapper and we're excited to continue to promote the album and the tour. Hopefully people can check it out when it comes to their area.